Zoë Foulks, Stacy Ross. Photo by Jay Yamada. What is love versus infatuation versus obsession? What is the role of women? Can feminism be reconciled with marriage and family? How can a mother guide a daughter without alienating her? Why do women make self-defeating decisions when virtually certain of the dark consequences? These are among the questions explored in Sarah Treem’s entertaining and sometimes surprising When We Were Young and Unafraid. Agnes, a single mother with progressive views, runs a bed and breakfast on Whidbey Island in Washington State’s Puget Sound. Often, she harbors battered women temporarily. Although she supports the runaways financially and emotionally, she insists that the women stay in their bedroom until their visible wounds are healed, so that they don’t scare the B&B guests. The year is 1972. The Equal Rights Amendment has passed the U.S. Senate and was sent to the states in the hope of ultimate ratification. Women have made some progress in politics. Youth counterculture, in full swing, provides a petri dish for women’s expression and greater freedom of behavior. But battle lines are already drawn, and a backlash from those with traditional views of gender roles emerges. Significantly, Roe v. Wade, which would legalize abortion, would not be adjudicated until a year later. Mary Anne, a typical victim of spousal abuse, arrives on the scene. Restless, and against orders, she can’t resist trips to the kitchen, where she will run into guests. Worse yet, she insinuates herself into the life of Penny, Agnes’s only child. A high school student with the highest academic aspirations, Penny also yearns for romance. Are the two objectives both attainable for her? Mary Anne bends Penny’s ear and offers a contrasting view of life and relationships from that of Agnes. To further complicate matters, Hannah, a bombastic and strident lesbian interloper, appears to offer yet another perspective on the role of women in society. Thus, each woman represents a different point on the compass and faces the consequences of decisions she has made about womanhood. But ultimately, the newly minted Penny faces the greatest challenges, as her feminine proclivities are evolving, and she must confront female adulthood afresh. Although When We Were Young and Unafraid was written in the 21st century, the playwright strategically set the action forty years earlier. Interestingly, the issues confronted in the play may be generally divided into two types. Some are almost timeless universals. Others travel the modern arc of women’s rights in this country. Its trajectory ascended rapidly during the 1960s and 70s with the expectation that following generations of women would not face the same agonies of the past – unequal treatment at work and school, double standards for behavior, spousal abuse, and more. As Treem implies, these issues are very sticky, and while progress has been made, more battles remain. Custom Made has selected well. The narrative compels and creates sufficient dramatic suspense. One criticism is that there is a revelation of major consequence that is dispatched as if it were of no significance. Director Tracy Ward’s production is well designed and executed, with appropriate staging and a great soundtrack of popular music of the day. Performances in the first act on opening night were stunning. The second act calls for more and deeper emotional commitments, but the acting was at times less convincing. Hopefully, this deficiency will be corrected over time. Nonetheless, the players are very well suited to the parts. Playing Agnes is Stacy Ross, one of the most respected performers in the Bay Area. She appears to be as comfortable on the stage as in her own kitchen. Liz Frederick as Mary Anne transforms wonderfully from the horror of abuse and escape to a dreamy eyed and confident mentor to Penny. Zoë Faulks at her career launch point plays Penny with great verve and charm, showing bright flashes. Most consistent, but perhaps least challenged, is Renee Rogoff, who blasts her way through the role of Hannah with great enthusiasm and authority. 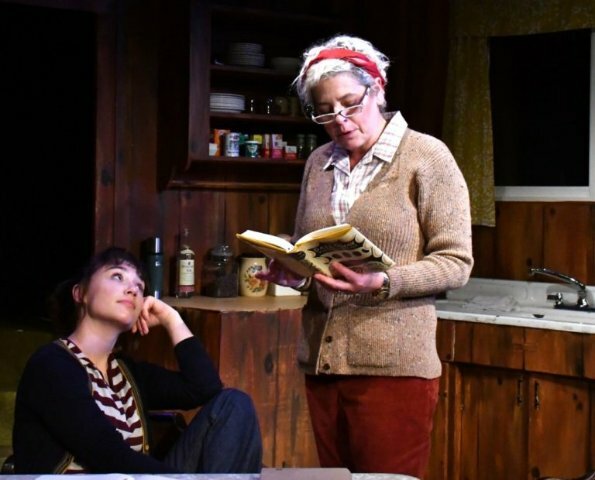 When We Were Young and Unafraid by Sarah Treem is produced by Custom Made Theatre and plays at their stage at 533 Sutter St., San Francisco, CA through February 9, 2019.